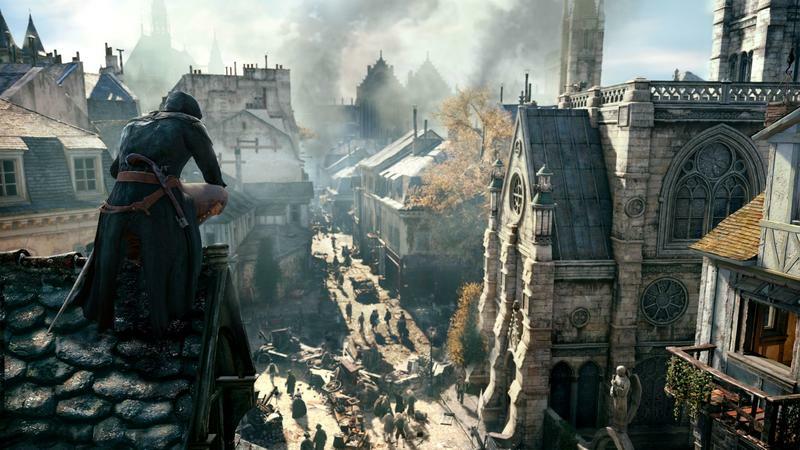 Ubisoft Didn't Lower Assassin's Creed Unity's Specs "For Any One System"
In an interview this week, Ubisoft Montreal producer Vincent Pontbriand made a mistake. He didn't just give gamers obsessed with console game resolution some kindling, he straight up dumped jet fuel on the fire. "We decided to lock them at the same specs to avoid all the debates and stuff," he told Video Gamer, speaking about Assassin's Creed Unity, which is locked to 900p resolution and 30 frames per second on both PlayStation 4 and Xbox One. He has to know that saying that would do exactly the opposite, right? When Assassin's Creed IV Black Flag hit the then-brand new consoles last year, it was also locked at a sub-1080p resolution on both consoles, but a later patch allowed the game to jump up to 1080 on PlayStation 4 after launch. So not only is this a hot button issue, but Assassin's Creed is a particularly touchy subject. In a statement to Kotaku, an Ubisoft spokesperson said "we did not lower the specs for Assassin's Creed Unity to account for any one system over the other." They added that "it's a process of building up toward our goals, not scaling down, and we're proud to say that we have reached those goals on all SKUs." Pontbriand did offer more detail on some of the limiting aspects of the game, but they didn't catch on quite the same way as that meaty quote. "The GPUs are really powerful, obviously the graphics look pretty good, but it's the CPU [that] has to process the AI, the number of NPCs we have on screen, all these systems running in parallel," Pontbriand told Video Gamer. "We thought that this was going to be a tenfold improvement over everything AI-wise and we realized it was going to be pretty hard. It's not the number of polygons that affect the framerate. We could be running at 100fps if it was just the graphics, but because of AI, we're still limited to 30 frames per second." At this point, it's too late for Ubisoft to put out the blazing fire his quote started, whether its official statement is true or not. If you have both consoles, though, you can pick whichever one your friends are on knowing that the game is the same on both systems, in order to get the best cooperative experience.